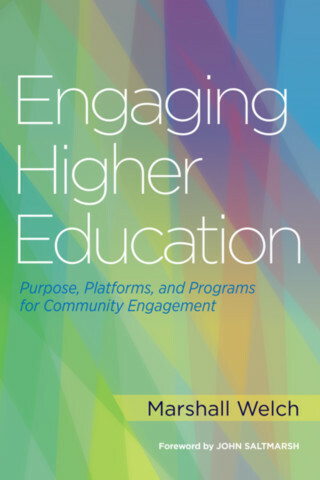 312 pp., 6" x 9"
“In Engaging Higher Education: Purpose, Platforms, and Programs for Community Engagement, Marshall Welch discusses the history of community engagement in higher education and argues that engagement is part of its original purpose. The book describes the history of community engagement in higher education, discusses opportunities for it to engage with the community, and concludes with ideas for community engagement programs in higher education. “Marshall Welch’s book is the new version of the book that Zlotkowski did [Successful Service Learning Programs] eighteen years ago, and equally invaluable. And like the earlier book, it captures the evolving nature of the infrastructure supporting campus engagement. This book has the kind of detailed richness that can only come through deeply grounded experience, the vast and deep practice knowledge that Welch brings to our understanding of the work of community engagement centers. And, as was true with Zlotkowski’s earlier book, this is an essential guide for community engagement professionals and for democratically engaged administrators who are tackling the challenges of educating for democracy and transforming their campuses. “Engaging Higher Education provides a compelling look at the recent decades that have shaped a view of the purpose and function of higher education in the United States deeply embedded within its communities. The author not only lays out an historical perspective and carefully defines what he means by engagement, he also provides models for structure and operations that offer a useful guide to those seeking to expand the engagement of their institutions in their communities and in cultural and political movements that form the turbulent environment in which 21st century higher education operates. Dr. Welch does a particular service to higher education by expanding on Ernest Boyer’s descriptions of the various forms of scholarship. He offers specific details about the impacts engaged scholarship has on faculty promotion and tenure and gives faculty guidance about how they can effectively lay out the case for their scholarships’ value and standards of rigor. If engagement has a strong future in colleges and universities, it must become integrated within the full spectrum of curriculum, inquiry and scholarship, teaching and reward structures for faculty within those colleges and universities. The various forms of engagement from service learning to social justice frameworks for scholarship receive full and thoughtful consideration in the text.